Wow! These Game Day Jalapeño Bacon Corn Muffin Bombs is a must add to your Homegating Recipes for your Big Game Party. They are the perfect side dish to compliment my awarding wining Texas Chili . Your guests for the Big Game party might eat more of these muffins than your homemade chili. You probably should make two batches. We usually go to our friends house to watch The Big Game. 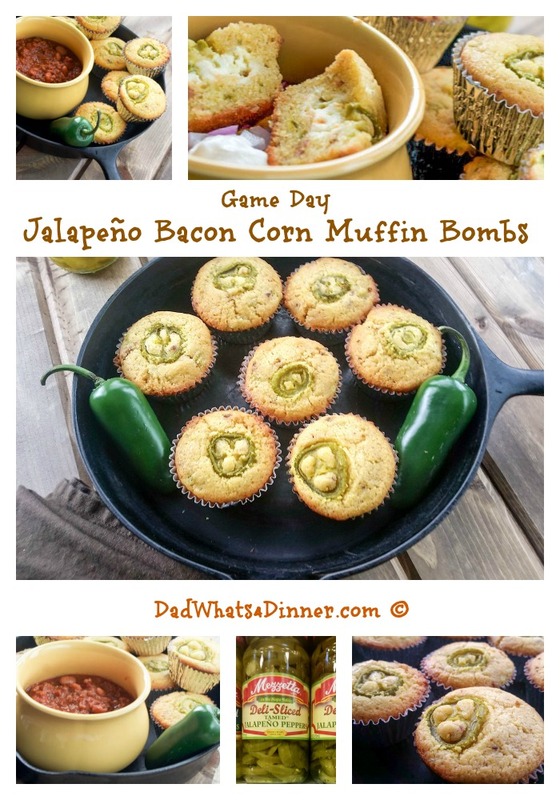 This year I will be bringing one of my chili recipes along with these Game Day Jalapeño Bacon Corn Muffin Bombs. 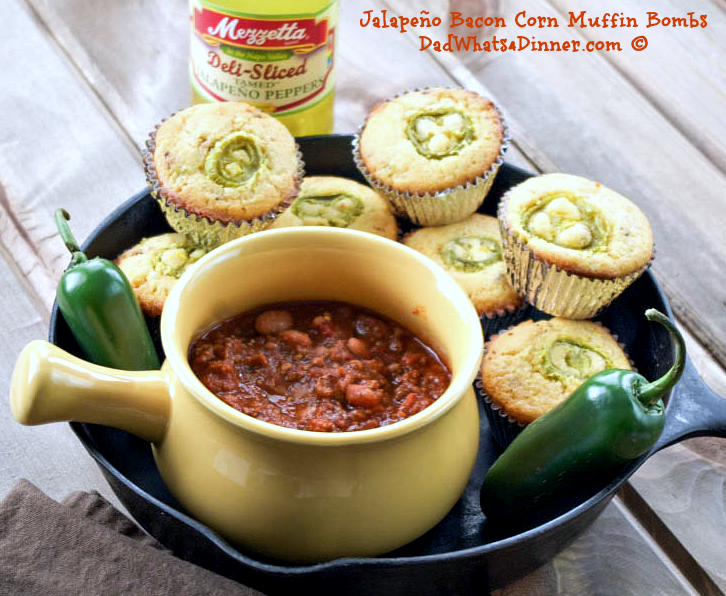 The flavors of the Mezzetta Jalapeño’s, bacon, cream cheese, pepper cheese and corn muffins is amazing. 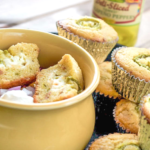 The little ball of jalapeño popper cream cheese filling is what will blow you away. I love jalapeño poppers. So I started making jalapeño popper dip, which is amazing. I need to post my recipe. I then created jalapeño popper taquitoes which I also need to post. Can you tell I have a small obsession with jalapeños, cream cheese and lots of recipes that need posting. So I was trying to come up with a way to get the popper filling inside of a muffin or puff pastry without the cheese mixture melting to quickly and oozing out. I solved the issue by creating a log of the mixture then freezing it. When ready to use, slice off 2 teaspoons of filling and place in the batter. The frozen filling allows the muffin to bake without the cheese oozing out. So when you bite into these Game Day Jalapeño Bacon Corn Muffin Bombs you get to experience the joy of a Jalapeño popper inside of an amazing corn muffin. When preparing your Homegating Recipes why not use the best ingredients to make your best dishes for the Big Game. I love Mezzetta products, quality ingredients at a reasonable price? Join the #Mezzetta Homegating Party to get great recipe idea’s for your big game party and a chance to win a 55″ LCD TV and Mezzetta Party Pack from the #Mezzetta Homegating Sweepstakes! What plans do you have for The Big Game?? Wow! 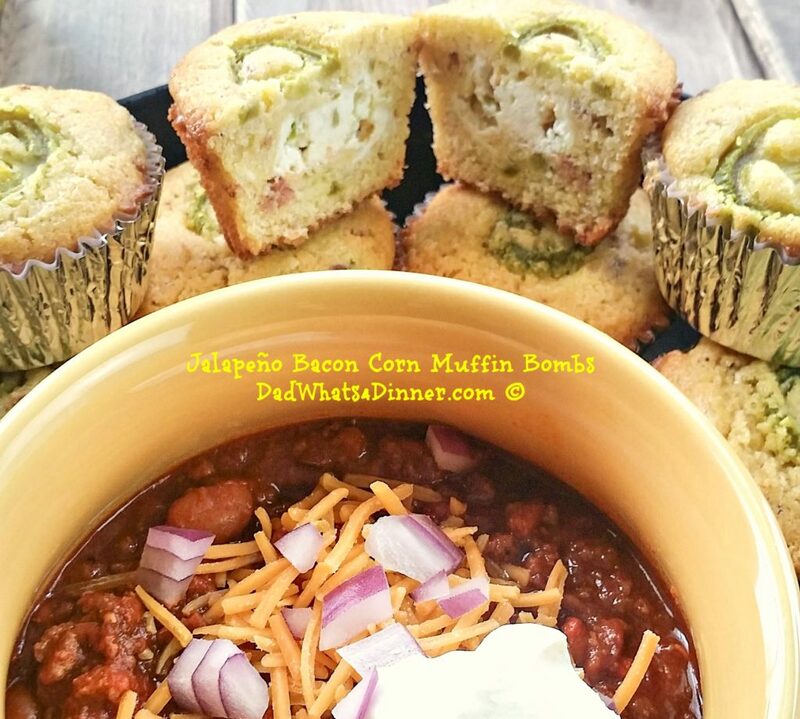 These Jalapeño Bacon Corn Muffin Bombs will make you forget about eating your chili. In medium bowl combine softened cream cheese, pepper jack cheese, cheddar cheese and diced jalapeños. Roll into a 1 inch thick log. Line 12 muffin tins with paper cups. Spray with cooking spray, set aside. Cook bacon, reserving two tablespoons grease. set aside. Sift together flour, cornmeal, baking powder, baking soda and salt. Whisk to combine. In mixing bowl, with whisk attachment attached, whisk together butter, bacon grease or oil, sugar and honey until smooth. Whisk in egg until combined then whisk in buttermilk. Mix until smooth. While mixer is running on low, slowly add in dry ingredients. Mix until just combined. Fold in diced jalapeños and bacon. Do not overmix. Place 1/2 tablespoon of Jalapeño Cream Cheese Filling on top of batter. Top with remaining batter, making sure cream cheese block is covered. 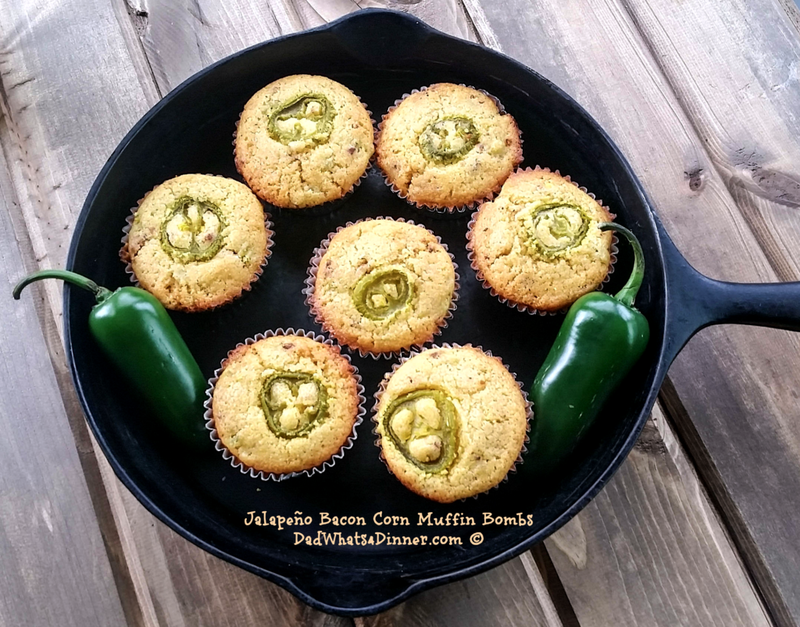 Top each muffin with [Mezetta Jalapeño peppers rings | https://ooh.li/425e928]. Bake for 5 minutes at 425°F and then reduce heat to 350°F and bake for another 16-18 minutes until a toothpick inserted comes out clean. Remove from oven, cool for 5 minutes before removing muffins from muffin tin. Especially her technique of high heat for 5 minutes to boost the rise in the muffins. Remember don’t forget to enter the #Mezzetta Homegating Sweepstakes for your chance to win a big screen tv for the Big Game. Share the tweet below to give all your wonderful followers the chance to enter to win. Quality ingredients, like the Mezzetta peppers…is what makes a good recipe great…. Mezzetta is a family owned since 1935, where the fourth generation of Mezzetta family is continuing the commitment to bring their customers the highest quality foods available. They source the finest fresh produce from the sun-drenched soils of California, Italy, Spain, France, and Greece and prepare them according to their Italian family recipes at their state-of-the-art production facility in the Napa Valley. Inspiration is just a twist away! These sound divine. I like the jalapeño ring on top. It puts everyone on notice that these muffins have a kick! What a perfect idea! 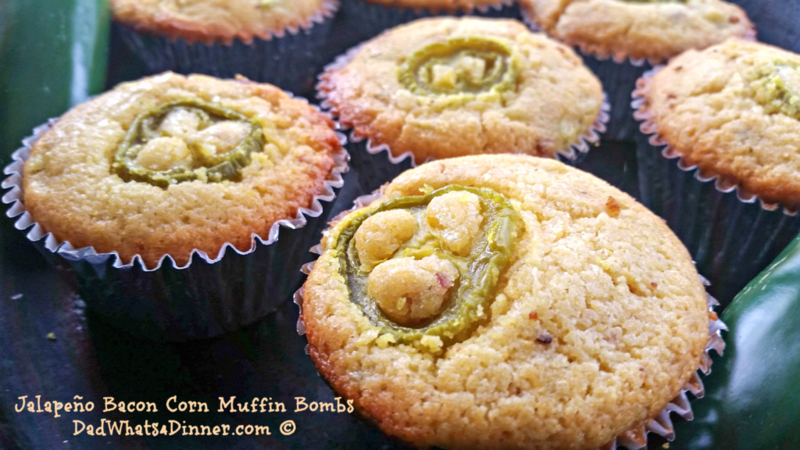 We love stuffed jalapenos too! In fact there is a running joke with them and my dad and how he makes them every week while the peppers are growing. No matter what he always gets the extra hot one, or so he says! We are always looking for ways to switch it up. I will have to tell him about these! Thanks Carlee. Have you tried jalapeño popper dip. Yum! Thanks for stopping by. I’m loving everything about this muffin. It would be the bomb with chili! Pinning!!! I am likewise jalapeno crazy and I adore jalapeno poppers! I love that you infused those flavors into these amazing corn muffins – plus bacon! What a delicious combination and definitely perfect for football game days and tailgating. These would be perfect with soup or chili and I’m pretty sure I’d be happy just snacking on them all by themselves. Yum! Thanks Kathryn. I crumbled a muffin for dinner tonight and topped it with sloppy joes. Very versatile. It is incredible with chili. Thanks for stopping by. Just stopped over to welcome you to FF! Have a wonderful weekend Quinn. Pinned these muffin bombs. I have to try them! Thanks Mrs. Julie. Talk to you soon. Happy FF! Thanks Arlene for Pinning and let me know what you think. What type of cornbread do they serve in Texas? These are brilliant!! 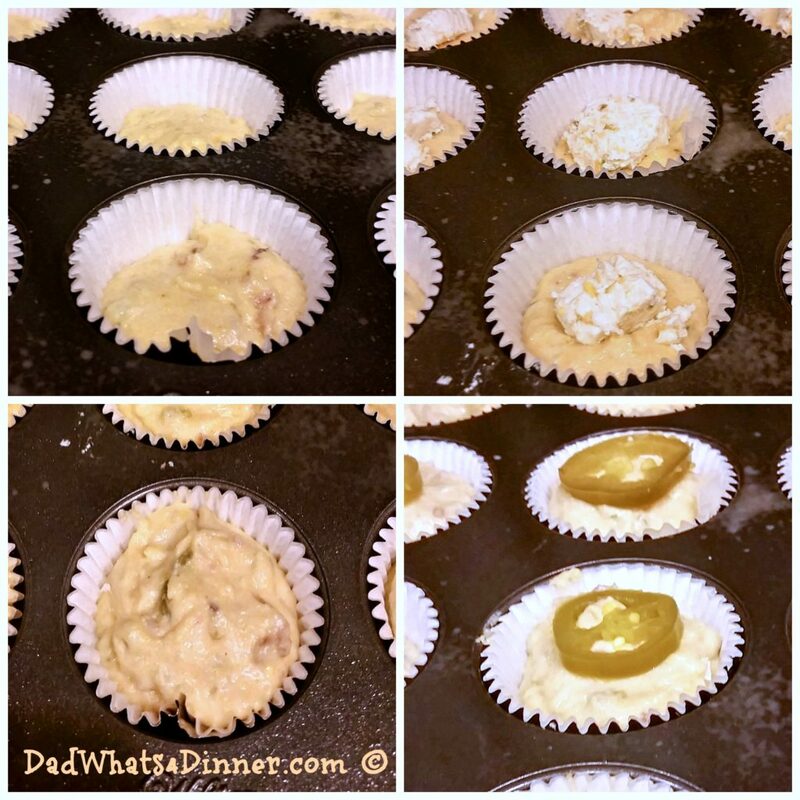 I’ve made pumpkin and apple muffins with cream cheese, but I wouldn’t have thought to combine cream cheese with jalapenos in a muffin! These look absolutely addictive…thanks for sharing the recipe! Thanks but I don’t if I would go brilliant 😀 but I was happy how the cream cheese filling, when frozen baked perfectly inside of the muffin. You should try cream cheese mixed with jalaopeno covered in a hot pepper jelly. Now that is brilliant. Have a great weekend. Cornbread isn’t so much of a think here in the UK (outside of ridiculous “American BBQ” efforts throughout the country, the vast majority of which are better left alone) which is an absolute shame because I absolutely adore it, cheese and chilli so you’ve basically made a post here about my dream combination 🙂 Definitely bookmarking, will give this one a go very soon. Happy FF! How do they attempt to serve american cornbread in the UK? In the US you have two very distinct types. Sweet cornbread which is more like a cake and then traditional cornbread which is not sweet at all and usually has a nice crust to it. I added a little sweetness to this recipe to complement the heat. Thanks for stopping by and Happy FF! These look delicious!! I love the cheesy centre 😀 I could definitely finish a whole batch very easily in one go! Happy FF!! I have eaten them many different ways this week. With chili, with sloppy joes, in a salad, and by themselves. They are very good. Thanks for stopping by Dini and Happy FF! BTW did you get a chance to check out the Mezzetta giveaway? Have a great weekend. Thanks Julianna. Have a great weekend. These sound so delicious! I love jalapeño in my cornbread and I love jalapeño poppers. Thanks Jhuls Happy FF to you too! Thanks. They are really good. Let me know how they turn out. I don’t know about heaven but they are pretty good. Thanks for stopping by and I am glad to share. This looks really great! I’ve got to try them! 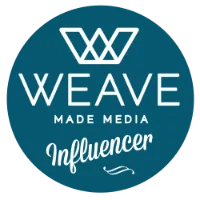 I would love to have you share this on my linky party -What’s for Dinner! Sure I would love to. Great name for a link party. Yum! These sound like “the bomb” 😉 Have a million other people said already? 🙂 Happy FF! I could use another million. Thanks they are pretty good, there is also a nice giveaway from Mezzetta on the site. Happy FF! Crazy isn’t it. Same too ya! Love this recipe – we love heat in our food at this house. Pinning for for the Big Game – happy to be rounding up with you again Quinn! Absolutely! I need to start promoting the roundup. I have been swamped the past few days. Great looking recipes.